Since 1967, the Komisyon sa Wikang Filipino [Commission on Filipino Language] holds its annual essay competition in relation to the celebration of Buwan ng Wika (previously Linggo ng Wika). 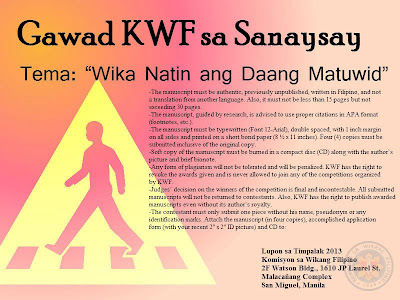 The Gawad KWF sa Sanaysay (previously called Gawad Surian sa Sanaysay - Gantimpalang Collantes) aims to sharpen, rekindle and further intellectualize the Filipino language. Entries must be sent personally or via registered mail. Entries sent via e-mail will not be accepted. Deadline of entries is on July 1, 2013 (Monday). 1. 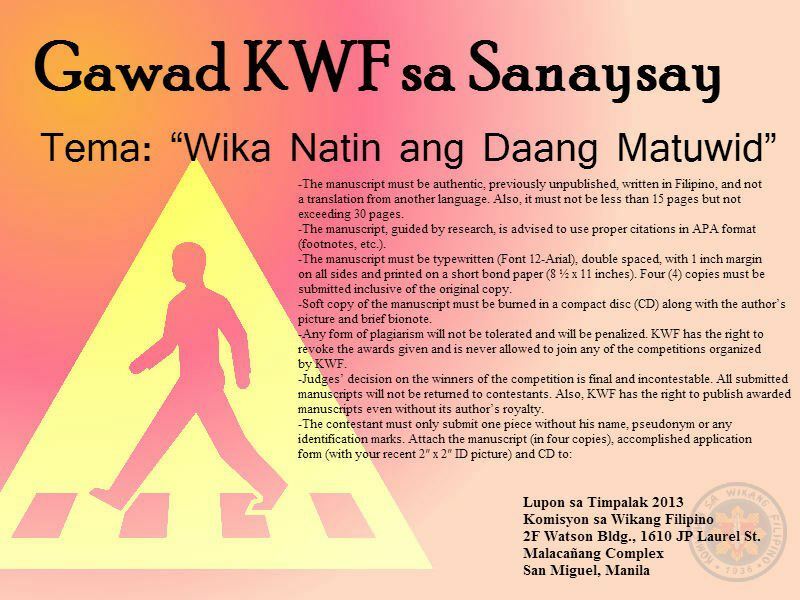 Gawad KWF sa Sanaysay 2013 is open to the public, except KWF employees and their relatives. 2. The topic must focus on the theme “Wika Natin ang Daang Matuwid,” using a Literary History approach. 3. The manuscript must be authentic, previously unpublished, written in Filipino, and not a translation from another language. Also, it must not be less than 15 pages but not exceeding 30 pages. 4. The manuscript, guided by research, is advised to use proper citations in APA format (footnotes, etc.). 5. The manuscript must be typewritten (Font 12-Arial), double spaced, with 1 inch margin on all sides and printed on a short bond paper (8 ½ x 11 inches). Four (4) copies must be submitted inclusive of the original copy. 6. Soft copy of the manuscript must be burned in a compact disc (CD) along with the author’s picture and brief bionote. 7. Any form of plagiarism will not be tolerated and will be penalized. KWF has the right to revoke the awards given and is never allowed to join any of the competitions organized by KWF. 8. Judges’ decision on the winners of the competition is final and incontestable. All submitted manuscripts will not be returned to contestants. Also, KWF has the right to publish awarded manuscripts even without its author’s royalty. 2F Watson Bldg., 1610 JP Laurel St.
For inquiries, e-mail us at komfil.gov@gmail.com or feel free to call us at (632) 736.2524/25; 736-2519 and look for Jomar I. Empaynado or Alyssa Romielle Manalo.